Elizabeth Blackwell was born on February 3, 1821, in Bristol, England to Samuel and Hannah Blackwell. Because Samuel Blackwell was a dissenter (one who refuses to accept the authority of an established church), the Blackwell children were denied public schooling. Samuel hired private tutors who went against English tradition and instructed the girls in the same subjects as the boys. Hannah Blackwell inspired her children by introducing them to music and literature. When Elizabeth was twelve years old, Samuel Blackwell brought his family to New York, New York. Samuel Blackwell soon became a strong supporter of abolition, the movement to end slavery in America. He also established a sugar refinery in New York City and was doing quite well until the economy faltered in 1837 and he lost most of his wealth. In 1838 the Blackwells moved to Cincinnati, Ohio, hoping for a new start. But within a few months Samuel Blackwell died, leaving his family unprovided for. The three oldest girls supported the family for several years by operating a boarding school for young women. In 1842 Elizabeth Blackwell accepted a teaching position in Henderson, Kentucky, but local racial attitudes offended her strong abolitionist beliefs and she resigned at the end of the year. On her return to Cincinnati, a friend who had undergone treatment for a gynecological disorder (having to do with women's reproductive organs) told Blackwell that if a woman doctor had treated her, she would have been spared an embarrassing ordeal. She also urged Elizabeth to study medicine. At first Blackwell disregarded the idea of becoming a doctor. But eventually her ideas changed, and the thought of becoming a doctor turned into an obsession. Friends discouraged her, though, and even recommended that, if she chose to study medicine, her best choice was to move to France, disguise herself as a man, and only then would she be accepted into medical school. In 1845 Blackwell moved to Asheville, North Carolina, where she taught school and, with the help of physician John Dickson, studied medicine in her spare time. Her next move, in 1846, was to a girls' school in Charleston, South Carolina, where she had more time to devote to her medical studies, this time under the guidance of Dickson's brother, Samuel. When Blackwell's attempts to enroll in the medical schools of Philadelphia, Pennsylvania, and New York City were rejected (by twenty-nine different schools), she wrote to a number of small northern colleges. In 1847 she was admitted to the Geneva, New York, Medical College. Blackwell later learned that her application to the Geneva school was initially rejected and she was only admitted as some sort of practical joke, for no woman had ever attempted to gain admittance into a medical school. All eyes were upon the young woman whom many regarded as immoral (sinful) or simply mad. At first Blackwell was even barred from attending classroom demonstrations. Soon, however, Blackwell's quiet personality and hard work won over her classmates and teaching staff. Her graduation in 1849 was highly publicized on both sides of the Atlantic. She then entered La Maternité Hospital for further study and practical experience. While working with the children, she contracted purulent conjunctivitis, an eye infection which left her blind in one eye. Handicapped by partial blindness, Dr. Blackwell gave up her ambition to become a surgeon and began practice at St. Bartholomew's Hospital in London. In 1851 she returned to New York City, where she applied for several positions as a physician, but was rejected because she was a woman. Blackwell then established a private practice in a rented room, where her sister Emily, who had also pursued a medical career, soon joined her. Their modest dispensary (medical office) later became the New York Infirmary and College for Women, operated by and for women. Dr. Blackwell also continued to fight for the admission of women to medical schools. In the 1860s she organized a unit of female field doctors during the Civil War (1861–65), where Northern forces fought against those of the South over, among other things, slavery and secession (the withdrawal of the Southern States from the Federal Union). In 1869 Dr. Blackwell set up practice in London and continued her efforts to open the medical profession to women. Her articles and her autobiography (1895) attracted widespread attention. From 1875 to 1907 she was professor of gynecology at the London School of Medicine for Women. She died at her home in Hastings in 1910, leaving behind a legacy that would pave the way for countless generations of female physicians. Brown, Jordan. 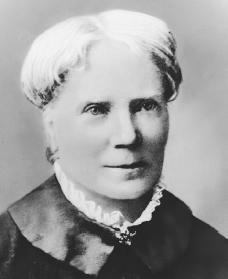 Elizabeth Blackwell. New York: Chelsea House, 1989. Glimm, Adele. Elizabeth Blackwell: First Woman Doctor of Modern Times. New York: McGraw-Hill, 2000. Kline, Nancy. Elizabeth Blackwell: A Doctor's Triumph. Berkeley, CA: Conari Press, 1997. What was Elizabeth Blackwell's personality traits? Elizabeth Blackwell's father was in the sugar business, and it failed- that's why the family moved to America. Elizabeth Blackwell lost the sight in an eye for this reason; she was treating a baby that had a disease in his eye by cleaning it out and got the same fluid in her eye and got the disease too. Later she had it removed and replaced it with a glass eye. After doing research on family history, I discovered that Elizabeth was my 5th great grandmother. I was excited to know this information. Elizabeth was 89 years old when she died. She died of May 31, 1910. She was part of a family with a total of 9 children. Their names were Anna, Marian, Elizabeth, Samuel, Henry, Emily, Sarah Ellen, John, and George. She also had 4 aunts that lived with her family, Barbara, Lucy, Ann, and Mary. Her parents names were Hannah and Samuel. She died in her house called Exmouth Place Rock House in Hasting, Sussex. Because the house was in Scotland the address is uncertain. In 1907, Elizabeth fell down a flight of stairs that left her almost completely physically and mentally disabled. She died on May 31 after a stroke that paralyzed half her body. She was a very headstrong person that often would not be able to compromise. She was also known for her acerbic critique of other women in the profession that sometimes led to criticism for her opinions. Blackwell was very assertive and found it difficult to pay a subordinate role among women. I'm trying to find an article that my daughter needs for school. She picked Elizabeth Blackwell as her Hero! But she is 9 years old and I'm having a hard time finding an article she can use for her research report or possibly even a book..
Any recommendations for a 9 year old 2nd Grader for an article or book!? PLEASE HELP!! i am still wondering if she got married? they didn't add everything in but a wish they did. it would only take a couple of very detailed sentences! Having decided to avoid marriage, Elizabeth Blackwell nevertheless sought a family, and in 1854 adopted an orphan, Katharine Barry, known as Kitty. They remained companions into Elizabeth's old age. I know that Elizabeth adopted Kitty, but was Kitty's last name Barry or was that her middle name? I am between Barry and Blackwell because I don't know if Elizabeth changed her last name.